In prior posts, the growth of domestic dairy consumption, U.S. population growth, and milk supply growth were reviewed. Fluid milk consumption is currently decreasing by 3.3% annually and the trend indicates that the decrease will continue to accelerate. Cheese consumption continues to increase but at a slower rate than prior decades. 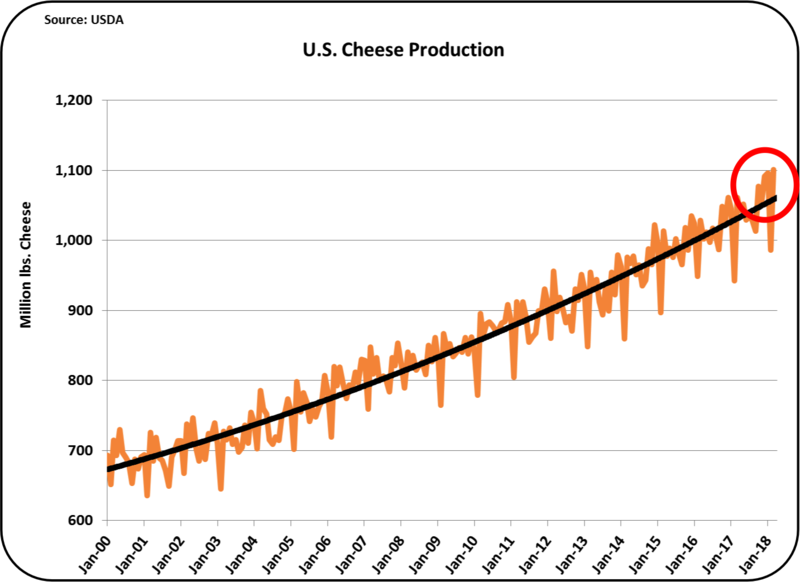 Cheese consumption increases have leveled off at about 2% per year. Butter consumption started increasing around 2009. 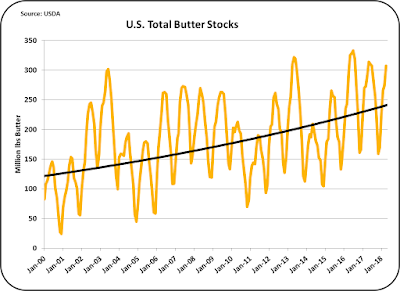 Currently, butter consumption growth is increasing by about 2.6% annually. U.S. population growth has slowed to about .8% annually. The milk supply is growing at about 1.5% per year. How do all these numbers reconcile? The answer is easy. They do not reconcile, and that is why there is an oversupply of raw milk. Future domestic consumption is fairly easy to estimate from the above growth statistics. Exports are the wild cards in this "reconciliation." 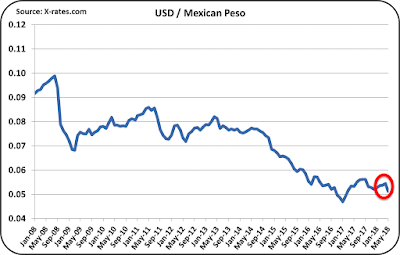 Exports can be significantly influenced by international events, exchange rates, tariffs, etc. 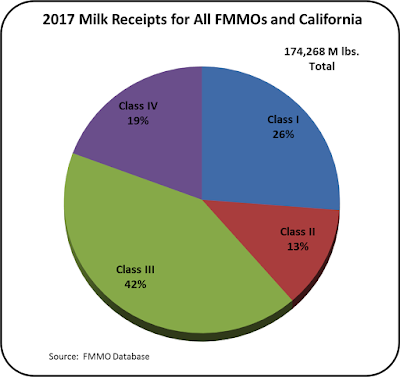 In 2017, the U.S. milk supply was used as shown in Chart I. What we know, is that Class I, fluid milk, is decreasing. That decrease is accelerating. Class I was the largest Class, but is now the second largest Class. Class III, milk for cheese. is continuing its long-term growth with no change is sight. It is the largest usage of milk. Class IV, milk for butter and skimmed milk, is growing primarily due to the growth in butter consumption. Class IV milk is split into two products, butter and skimmed milk. The growth is driven by butter consumption and what remains, skimmed milk, must be sold at prevailing prices. The growth-forecasting dilemma for Class IV milk is that most Class IV skimmed milk is exported. For the first four months of 2018, 86% of nonfat dry milk was exported. Two forecast scenarios were developed based on the current consumption levels and trends in the the consumption rates. One forecast, Scenario One, is simply based on an extension of 2017 rates of change. The second forecast, Scenario Two, is based on current rates of change and trends. Fluid milk consumption is in an accelerating decline and butter consumption growth, currently at 2.6% annually, is slowing down. Scenario Two takes into account not only the current rates of change, but future rates based on trends. Table one shows how an extension of the current growth changes, Scenario One, would impact the milk Class categories. Class I will continue to decline while Class III and Class IV will continue to grow. Class II, the smallest Class was assumed to grow at the rate of population growth. How much milk is needed? In Scenario One, the increase in domestic dairy consumption would range between .6% and .9% per year through 2025. This growth rate in domestic consumption is well below the current 1.5% annual growth in the milk supply. 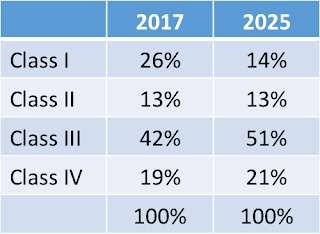 Table I below shows the breakdown by milk Class currently and in 2025 based on a continuing of the current rates of change. Class III and IV would consume 68% of the milk supply by 2025. Table I - Scenario One - Milk Classes for 2017 and 2025 based on Current Growth Rates. Scenario Two takes into account the trends in dairy consumption. The decline in fluid milk is gathering speed. 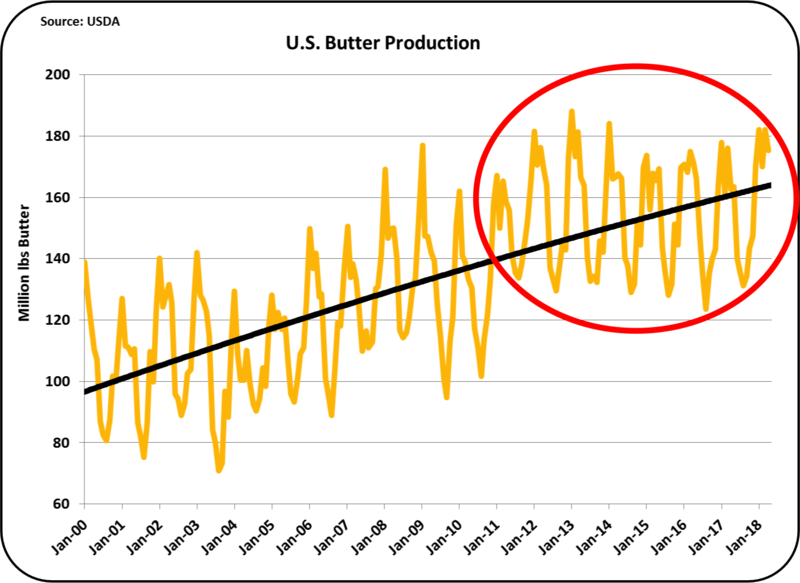 The annual growth rate of butter consumption is beginning to level out and decline to a growth rate more like cheese of around 2%. In this scenario, Class III milk would consume 51% of the milk supply by 2025. In Scenario Two, the growth rate for raw milk will become negative. That means about .5% less milk is needed each year. The current 1.5% growth rate in the milk supply will have to drop by about 2% to reach a decline of .5% per year. Each year, another .5% decrease would be needed. Can exports really make up for this loss in domestic milk consumption? 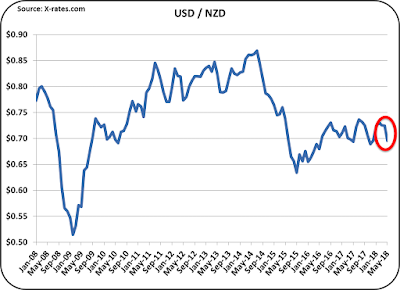 Can exports bring enough demand to allow the milk supply to continue to grow? The most recent export volume was close to 19% of milk production. If it were to grow sufficiently to make up for the loss in Scenario One, exports would have to grow to about 25% of milk production by 2025 If Scenario Two occurred, exports would have to grow to about 35% of milk production by 2025. As exports grow, volatility in milk demand and milk prices will increase. There are many uncontrollable events that can drastically change international exports. 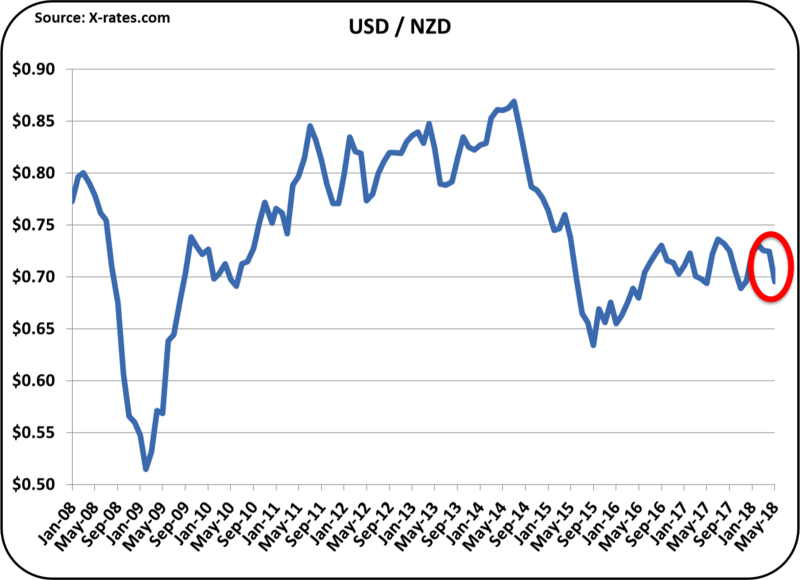 New Zealand lives with export volumes around 80% of their milk production. They have done an excellent job of very low cost production and strong international brands. However, they still live with a great deal of volatility. What will limit U.S. growth in the milk supply? Low prices? The headlines from the USDEC announced, "Exports were equivalent to 18.8 percent of U.S. milk production, an all time high. Volume was up 31 percent from April 2017." That is a tremendous accomplishment. 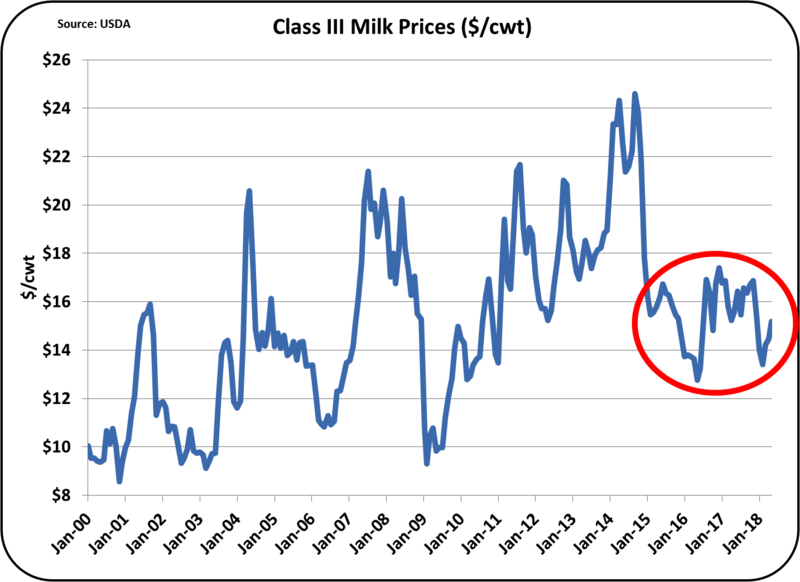 As stated many times in this blog, the Class III price is the the basis for payment for most dairy producers, and the price of cheese is the driver for the Class III price. 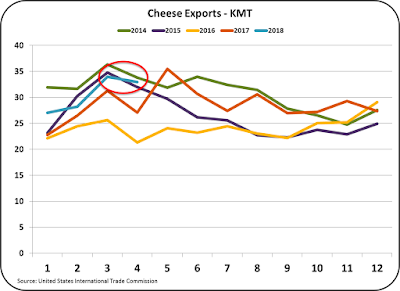 Unfortunately, cheese exports were down from the prior month and cheese imports were up. 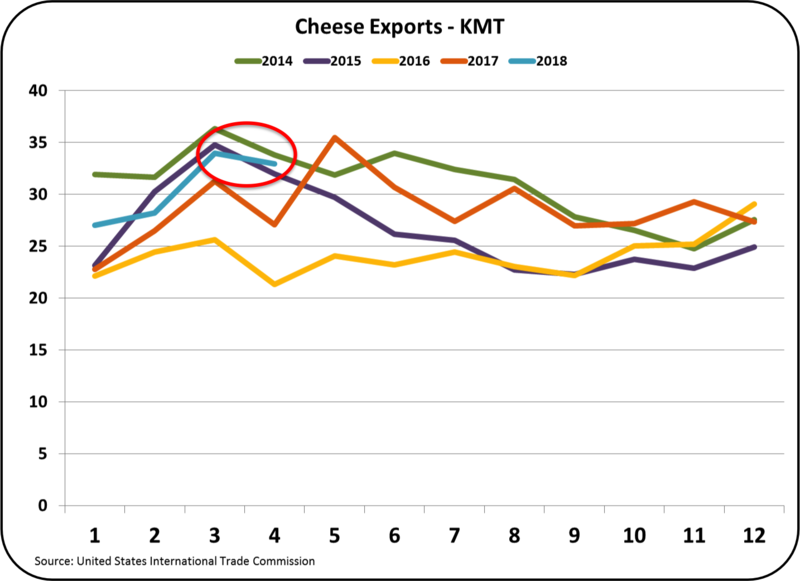 It is not unusual for cheese exports to drop in April, so that can be expected. 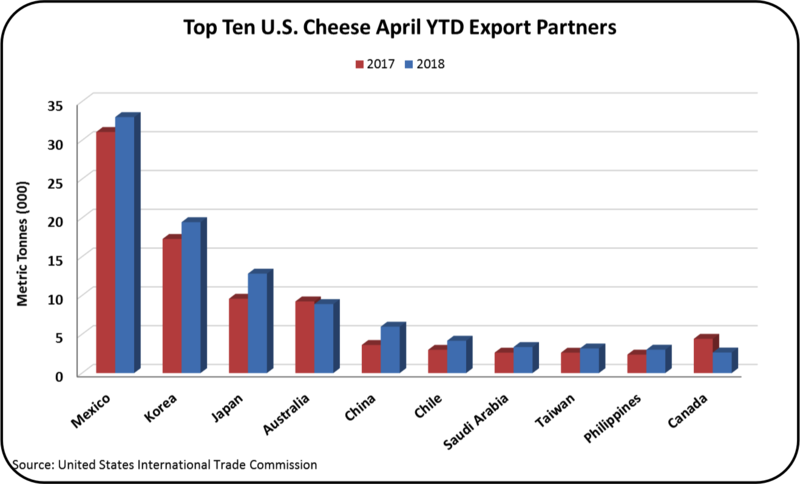 In fact, the 2018 April drop was less than the prior four years as shown in Chart I.
Year-to-date there were gains in cheese exports in most all the countries where the U.S. sells cheese. 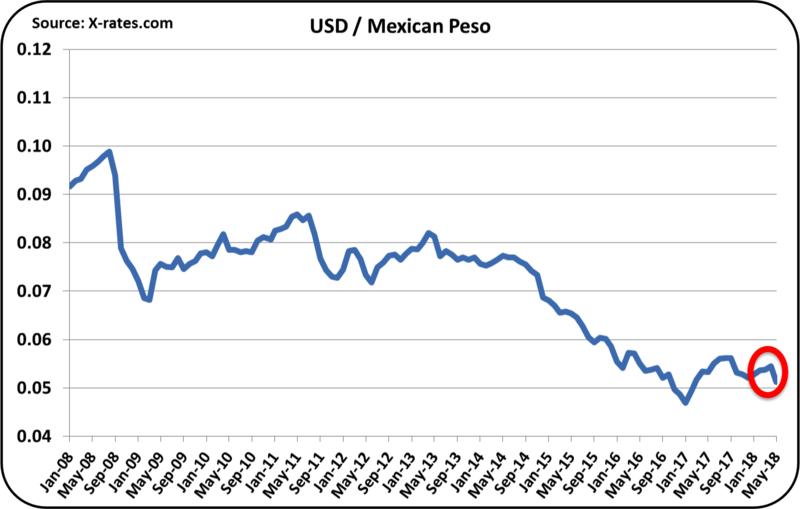 Mexico is by far the largest buyer. South Korea and Japan also have healthy volumes and nice gains. 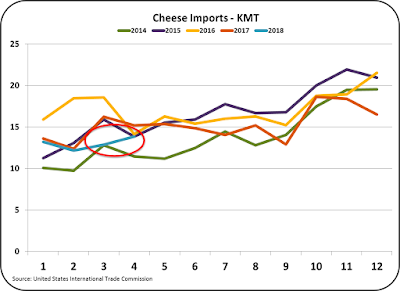 Typically, in April cheese imports also drop. 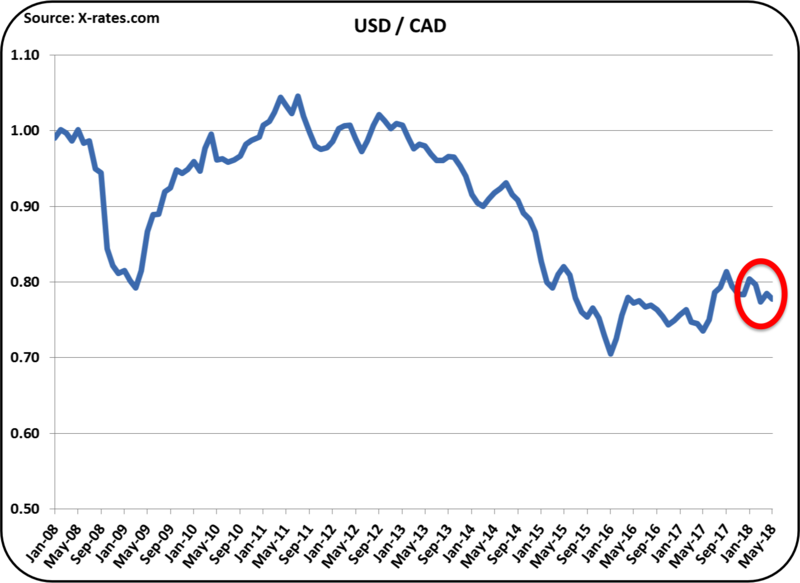 Unfortunately, imports were up significantly in April 2018 as shown in Chart III below. Chart IV shows the imports by country. 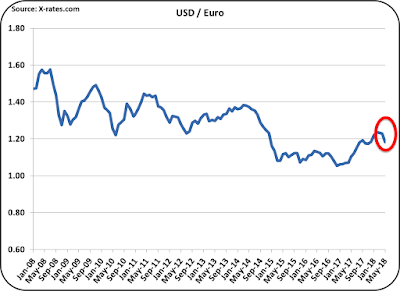 All the significant imports came from European countries and YTD their purchases are mostly even with the prior year. Most of those imports are typically specialty cheeses, not commodity cheeses like cheddar blocks and barrels. Specialty branded products are typically a consumer choice and are therefore more difficult to replace with domestic cheese. The combination of lower cheese exports and higher cheese imports, caused net cheese exports (Chart V) to take a significant tumble. And, as a result, cheese inventories continued to grow. 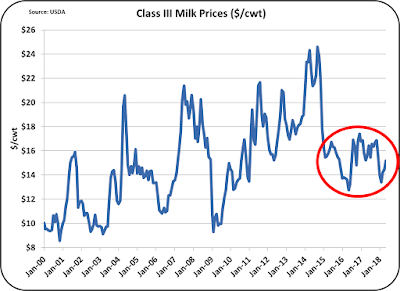 As the inventories grow, cheese prices drop and in-turn, the Class III milk price drops. This will bring the Class I price down as well. The Class I skim price is the higher of the Class III or Class IV prices. As shown in Chart VII below, the Class III price, although low, has been higher than the Class IV consistently in the last year. The combination of a lower Class I and Class III milk price will have a definite negative impact on producer prices. 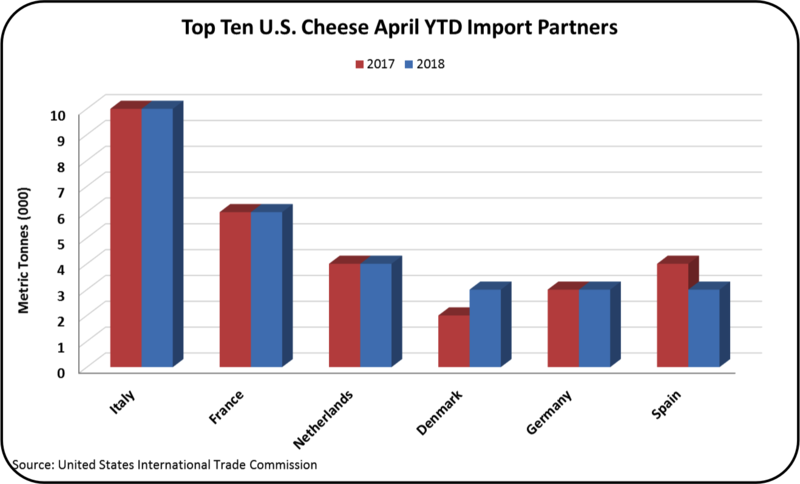 While the month of April was overall an excellent month for dairy exports, the most important item for producer pricing, cheese, was not positive. 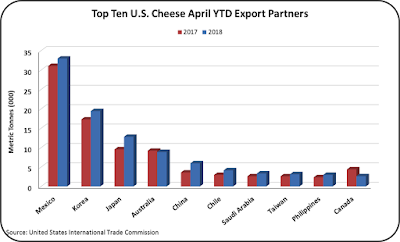 Much of the funding for USDEC comes from producers and the emphasis needs to be on cheese exports if milk prices are to improve. 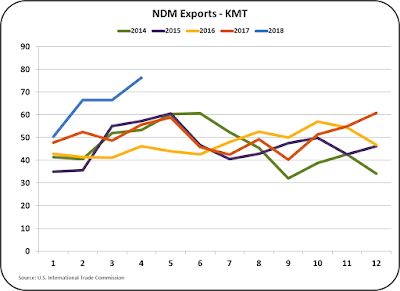 What really did set records in April was Nonfat Dry Milk/Skim Milk Powder (NDM/SMP) exports (Chart VIII). And, as a result, inventories took a plunge in April (Chart IX). 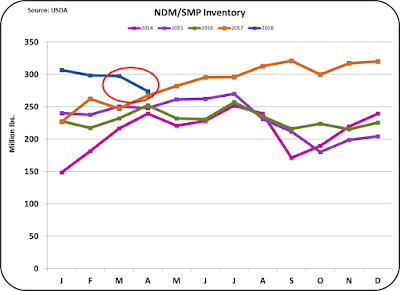 NDM/SMP is primarily a export product and prices are heavily influenced by International supply and demand. 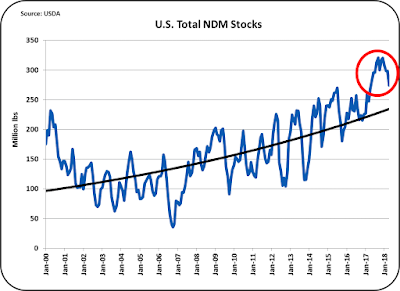 In order to move the record setting volume of NDM April prices were down 30% from January 2017. 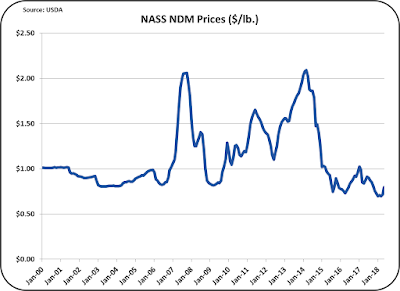 A 30% reduction in the price of NDM results in a 20% drop in the Class IV skimmed price. Very little butter is exported. 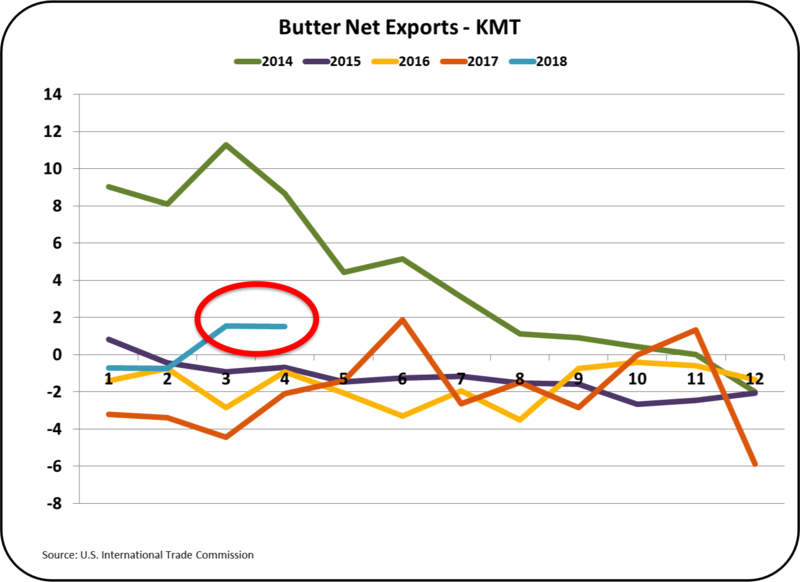 Chart X below shows that the U.S. is now a net butter exporter. However, the numbers are very small. What butter is available is needed for domestic consumption. 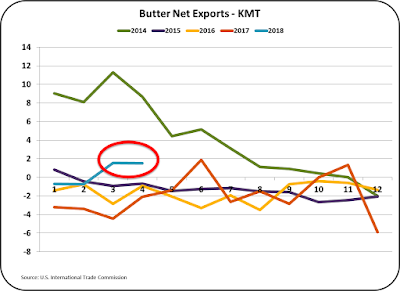 Butter exports were up in April, however, so were imports, leaving March and April net exports at the same volume. 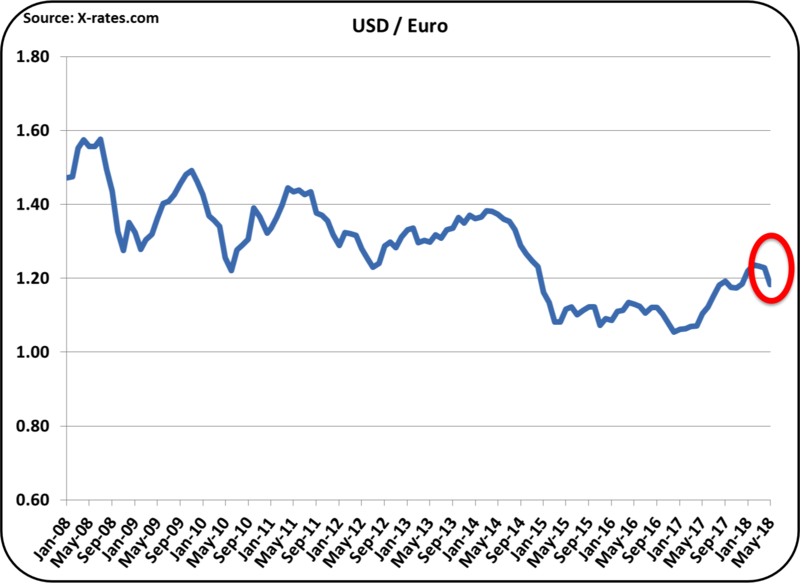 Exchange Rates with international dairy competitors and customers show a strengthening of the USD against other currencies (Charts XI to IXV). A strengthening of the USD makes U.S. dairy products more expensive on the international market. To be competitive, U.S. dairy products must be sold at a lower price. By all the headlines, dairy exports are doing very well and setting records. More solids being exported do reduce the level of milk oversupply. However, exports of some products have much more of an impact on the milk price than other exports have. Cheese prices are linked closely with the milk price and therefore cheese exports are the most important. 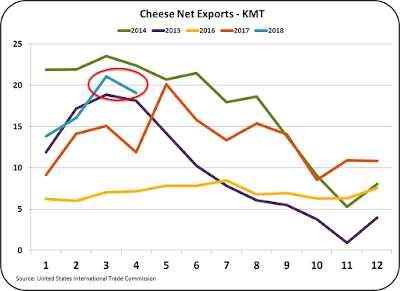 Cheese exports have not set an all time export record. A record level of cheese exports are needed to reduce the bloated cheese inventories. May Class and Component Prices were announced on May 31. The Class III price was up, the Class IV price was up, the butter price was up, the cheese prices was up, the dry whey price was up, the milk protein price was up, the butterfat price was up, and the "other solids" price was up. 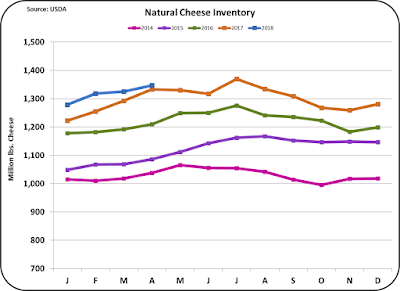 Unfortunately, at the end of April cheese and butter inventories were also up, which usually drives prices down. 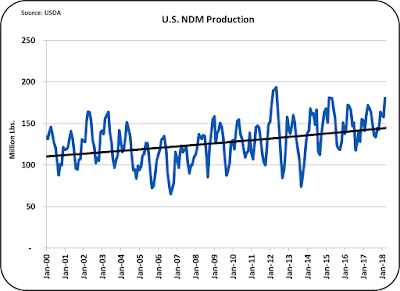 The increasingly high inventories may dampen future producer dairy prices. Many of the charts below are based on 18 year market changes. This is intended to give a long-term perspective on the current production, inventory, and price levels. 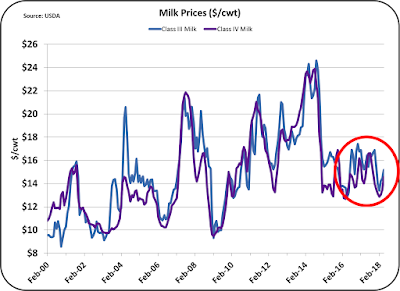 Chart I below shows the price increases of commodities used to price milk and the resulting component prices. It is extremely unusual to see all of the prices in blue, indicating an increase from the prior month. While this is very positive, many of the charts following will put this in long-term perspective. 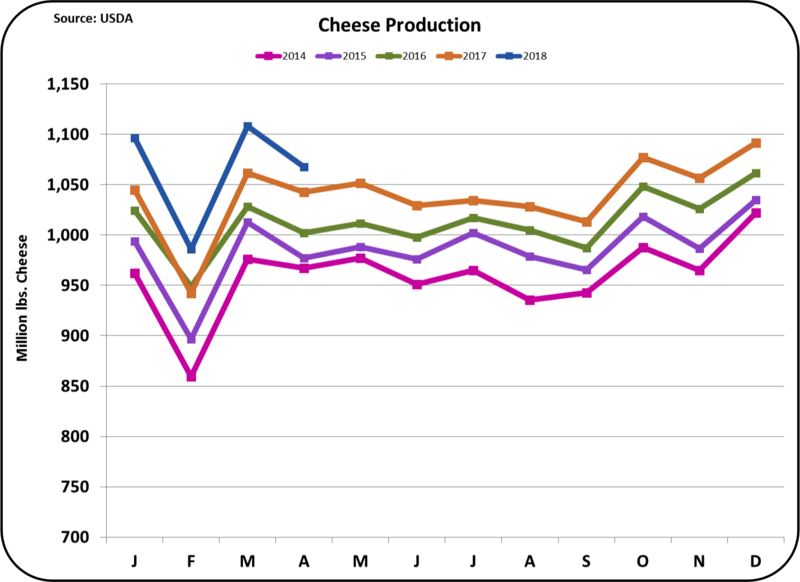 Cheese production continues to be robust and inventories remain high. Charts II and III below show the growth in production, which is growing at rates far above the amounts needed for domestic consumption. 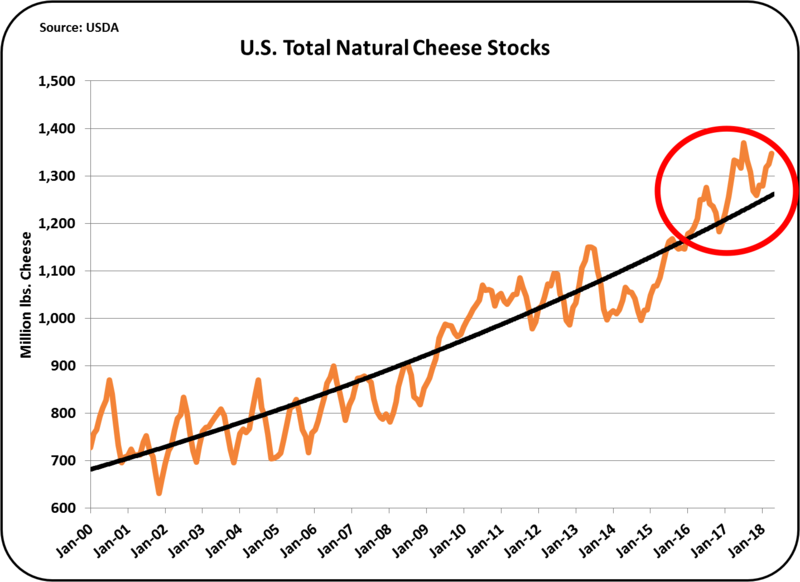 In Chart III of the March 31 post to this blog, the growth of domestic cheese consumption was shown to be leveling out at about 2% annually. Cheese production is growing at rates much above 2%. While growth rate in domestic consumption is declining from historical levels, production is increasing. This scenario will drive inventories up and prices down. The only other solution is increased exports, and while exports of cheese are growing, they are not growing fast enough to match the growth in production And, the export of cheese could easily be interrupted by the recent Mexican threat of increasing tariffs on cheese imported from the U.S. or other international events. The result is as expected. 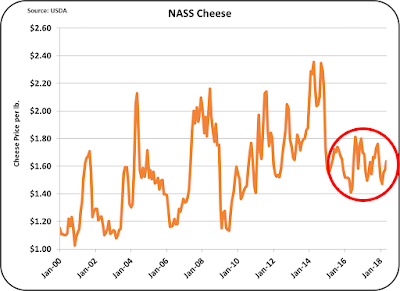 Cheese inventories for the last 2 plus years are at levels well above the norms (Chart IV). 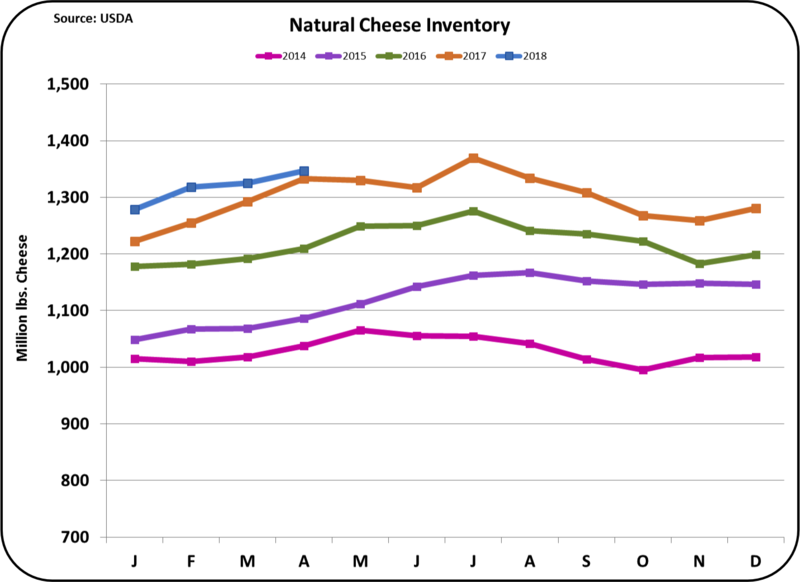 The "over norm" cheese inventory levels have continued for a record time span. 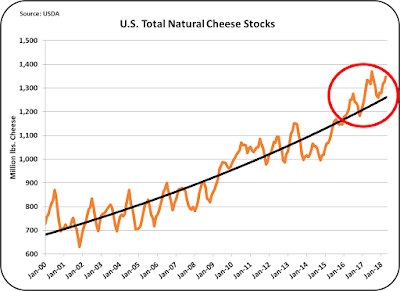 Chart V below shows the impact of high inventories on cheese prices. 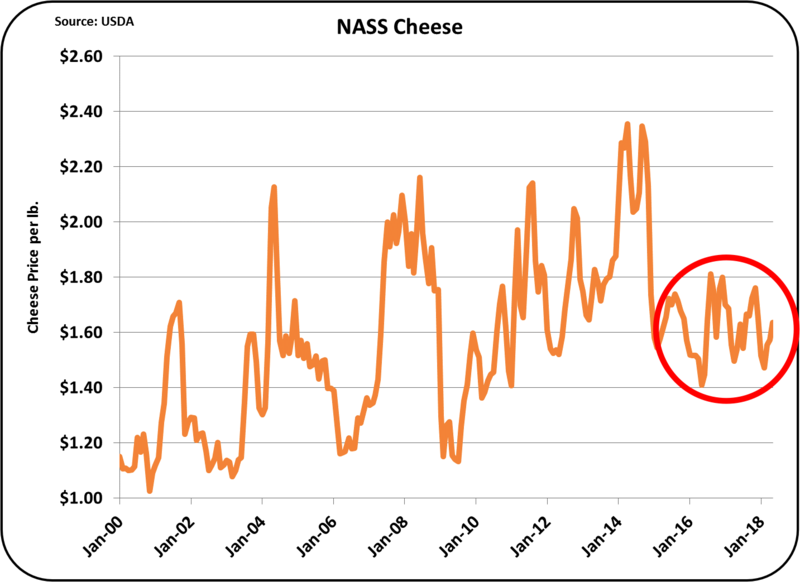 During this time of extremely high inventories, the price of cheese is staying in a low, narrow range of $1.40/ lb. to $1.80/lb. Why is so much cheese being produced? The answer is simple. Too much milk is available, much on contract, and the cheese can be stored. Until the excess milk supply and over-production of cheese can be corrected, cheese prices will continue to be low. 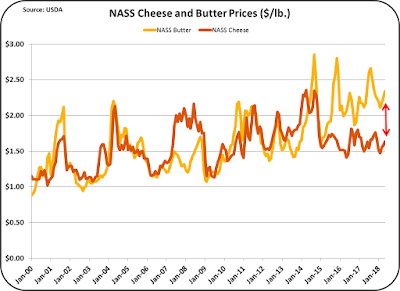 The price spread between butter and cheese (Chart VI) has continued with the current spread at $.69/lb. The spread was first covered in the April 8 post to this blog. 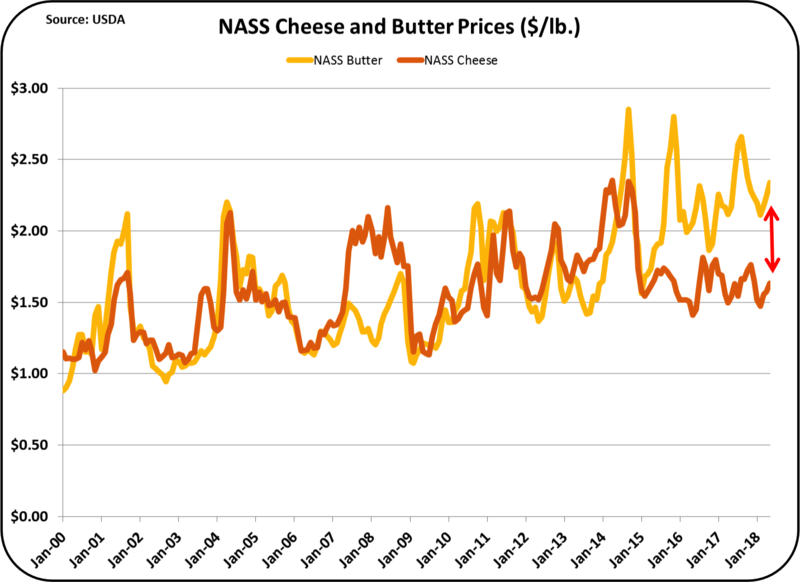 Since the beginning of 2015, the price differential between butter and cheese averaged $.62/lb. The current differential of $.69/lb. shows a widening of that spread. 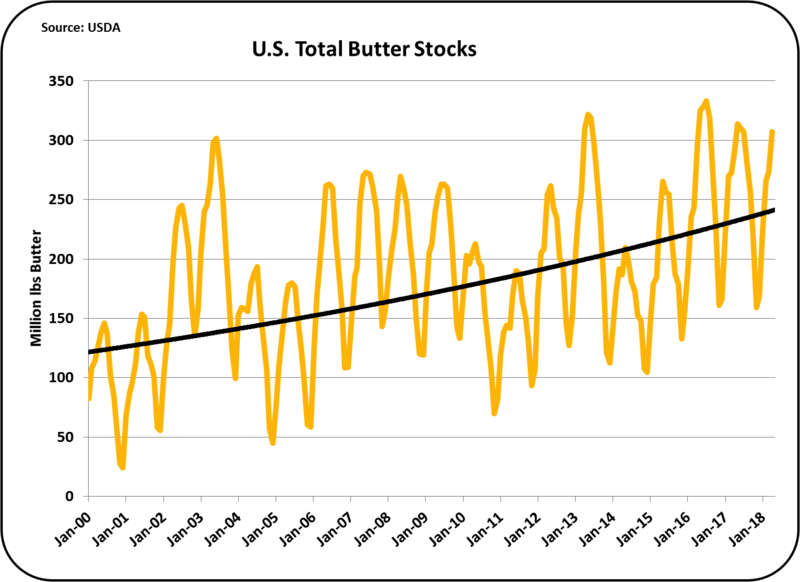 Inventories of butter (Chart VII) have stayed in line with butter growth except for a few periods like 2011/12 and 2014/15. Supply and demand have keep inventories low and prices high. 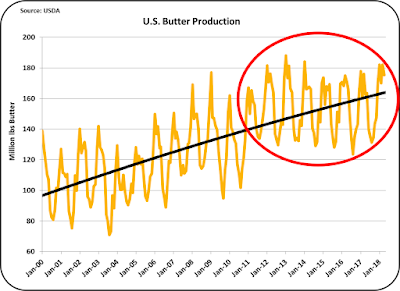 Production of butter grew at a steady rate for ten years starting in January 2000. It then took a breather and did not grow for the next seven years. Domestic consumption continued to grow during this time span resulting in tight inventory levels. 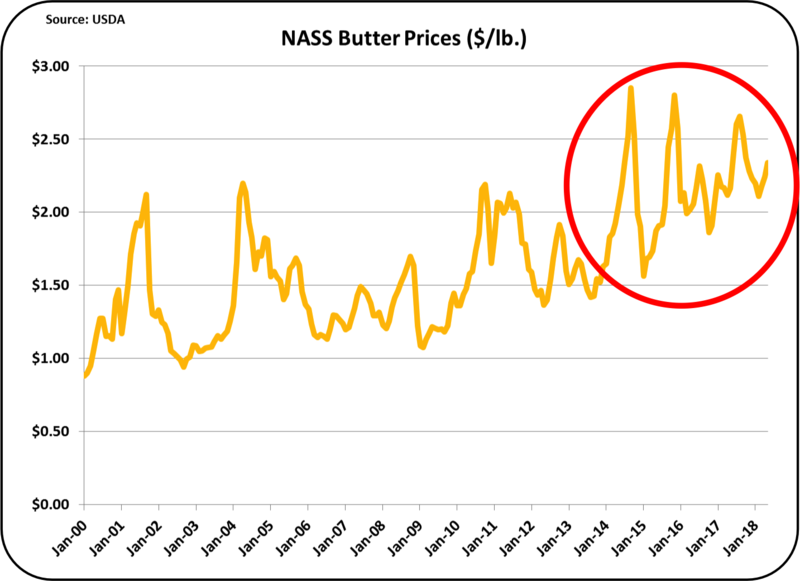 in 2018 there has been some increase in butter churning, but not enough to increase inventories. 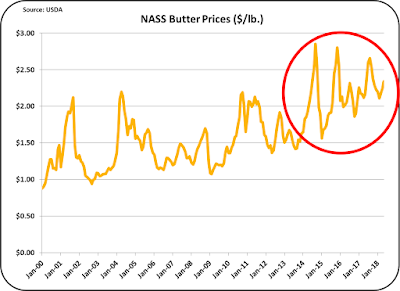 The slowdown in the growth of butter churning began having an impact on butter prices in 2014 and that impact has kept butter prices above $2.00/lb. since then. 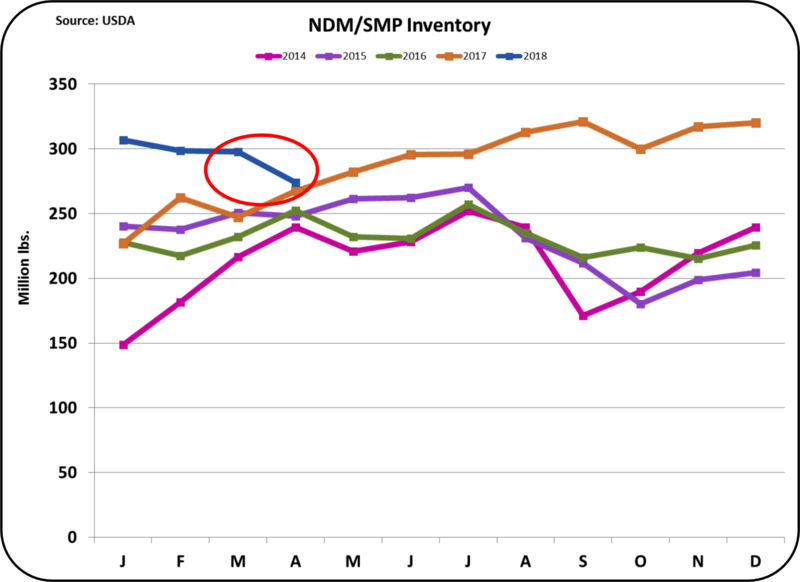 Nonfat Dry Milk/Skimmed Milk Powder (NDM/SMP) has seen some similar long-term activity resulting in high inventories. Production, Chart X, shows a pretty steady growth. Inventories (Chart XI), show a gradually growth from 2005 to 2015. However, beginning in 2016, inventories grew at a new extreme level. 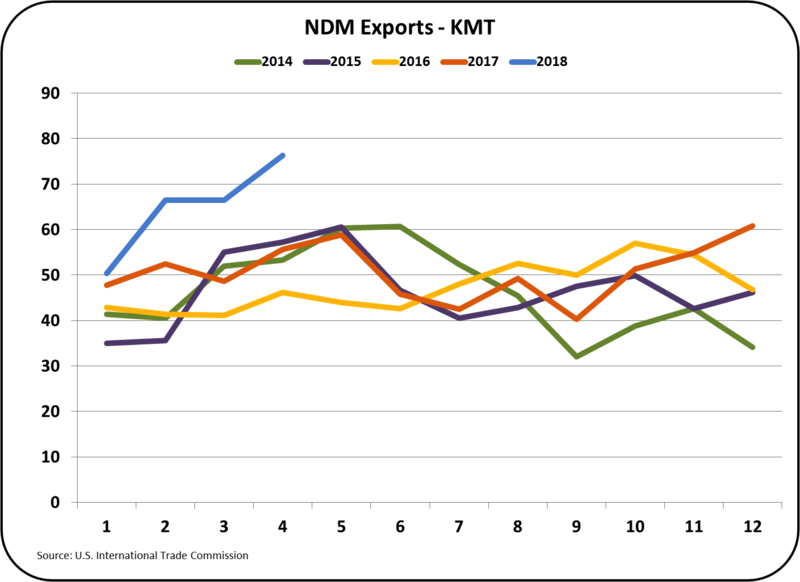 NDM/SMP is primarily an export item. Not only does the U.S. have an oversupply problem, but the whole world has an oversupply problem. 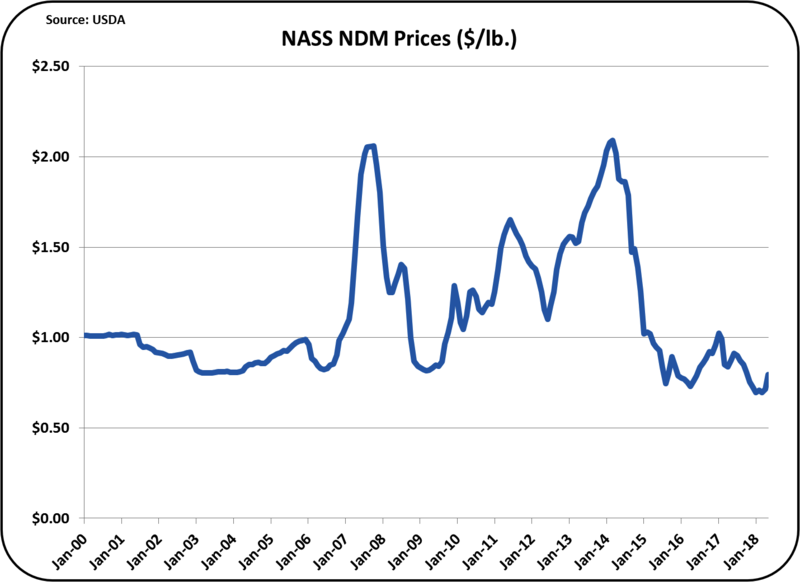 As one might expect, NDM prices have plummeted. 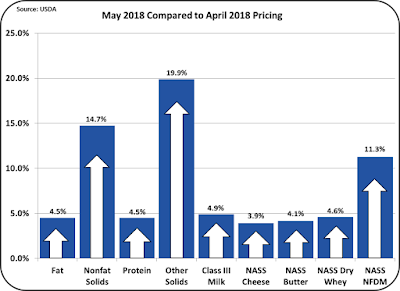 May showed price gains in every commodity used to price milk and every milk component (Chart I). 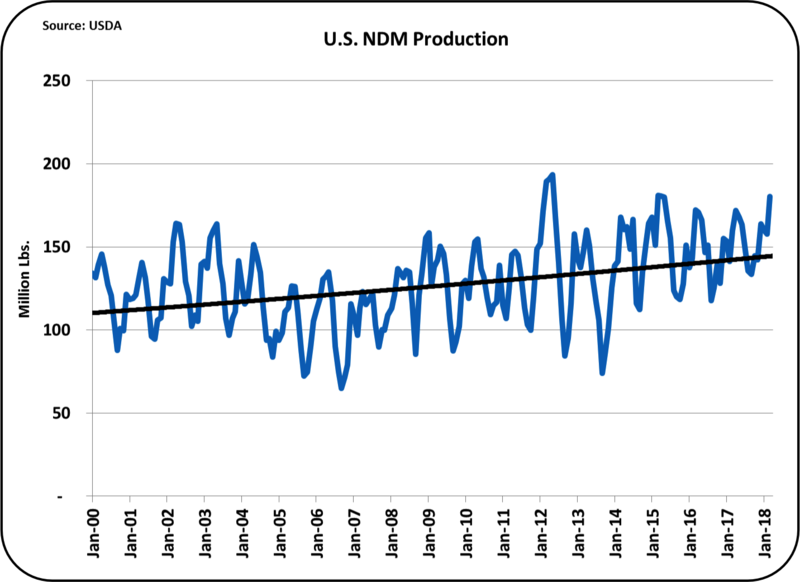 However, from a long-term point-of-view, the U.S. dairy industry is still stuck in a low milk price position (Chart XIII) with over-production at a time when fluid milk consumption is shrinking. 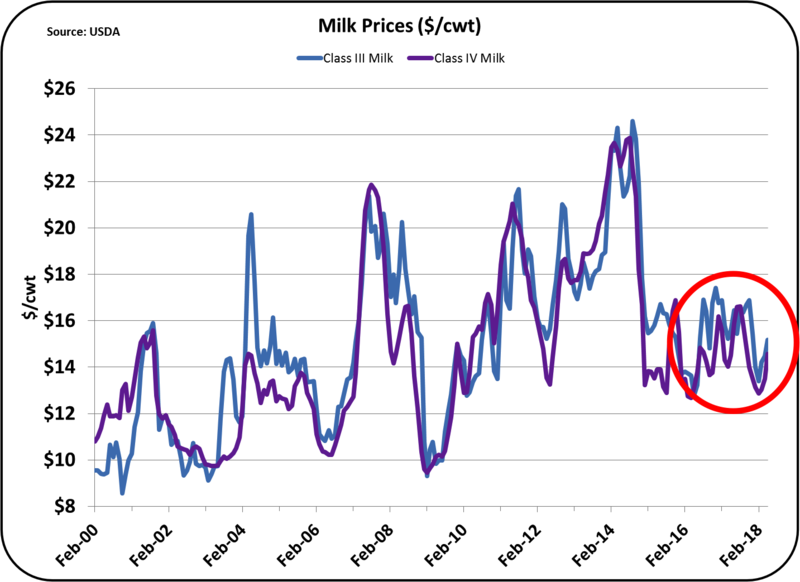 Low producer milk prices typically force higher cost producers to abandon milk production. This is happening, but slowly and in small amounts. There are at least five events that are adversely influencing producer prices; over-production of milk, the rapidly shrinking market for fluid milk, the growing demand for butter which leaves skim milk looking for a market, the over-production of cheese, and the uncertainty of exports. These events will continue to be followed in future posts to this blog.